Phenytoin is used in the treatment of generalized seizures, partial seizures, acute symptomatic seizures, and status epilepticus. It has a narrow therapeutic range of plasma concentration and follows nonlinear kinetics of elimination, resulting in an elevated risk of producing toxicity. Hyperammonemic encephalopathy is associated with sodium valproate, but there are case reports of its association with other antiepileptic drugs such as topiramate, zonisamide, phenobarbitone, and carbamazepine when used with or without valproate., Phenytoin may alter the propensity of sodium valproate to cause hyperammonemia. However, phenytoin causing hyperammonemic encephalopathy has not been reported earlier. Hence, we report one such case here. A 55-year old man, suffering from chronic idiopathic generalized epilepsy, was admitted with complaints of acute alteration in behaviour, drowsiness, and altered sleep pattern, without any history of fever, vomiting, headache, focal weakness, or alcoholism. He was on oral phenytoin 400 mg/day and suffered from breakthrough seizures intermittently. He suffered a breakthrough seizure for which he was treated at a local clinic with intravenous 600 mg of phenytoin. Although he did not have recurrence of seizure after the episode, he became drowsy, irritable, and was responding inappropriately. On examination, he was opening eyes on command, giving inappropriate answers to questions, and was localizing to painful stimuli (Glasgow coma scale score: 12). Signs of meningeal irritation were negative. The pupillary and fundus examinations were normal, but bilateral gaze evoked nystagmus was present. He was also clumsy in following motor commands and grossly ataxic when made to stand or walk. There were no lateralizing signs, and planter responses were bilaterally extensor. The rest of his physical and other system examinations were normal. 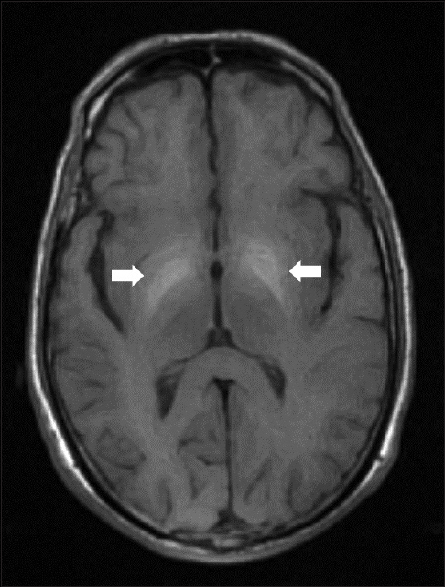 Magnetic resonance imaging (MRI) of the brain showed bilateral basal ganglia hyperintensities on T1-weighted images with no postcontrast enhancement [Figure 1]. There were other discrete hyperintensities on T2 and fluid attenuated inversion recovery (FLAIR) sequences [Figure 1]. He had previously undergone computed tomography (CT) of his head but it was not available with him, which he reported to be normal. The 16-channel electroencephalogram showed generalized polymorphic delta wave slowing, suggestive of diffuse encephalopathy [Figure 2]. There were no epileptiform discharges or triphasic waves. Blood investigations such as complete blood count, liver and renal function tests, electrolytes, chest X-ray, and electrocardiography were normal [Table 1]. As we were unable to find the cause of encephalopathy, we evaluated the plasma ammonia level along with phenytoin level. Both were found to be high. His plasma phenytoin level was 23.77 μg/ml (normal: 10–20 μgm/ml.) and plasma ammonia level was 336 μmol/L (normal: 16–60 μmol/L). We did not consider other metabolic disorders of genetic origin in view of his normal development, with cognition and seizure being the only complaints over the years. Thus, he was diagnosed as a case of phenytoin toxicity with phenytoin-induced hyperammonemic encephalopathy. Phenytoin was changed to levetiracetam. Subsequently, he started improving and became normal by the fourth day. Phenytoin is one of the common antiepileptic drugs used in India because of its low cost and wide availability. Its toxicity not only depends on its pharmacokinetic profile but also on the type of drug preparation, such as prompt vs sustained release medication, as well as the patient's profile in relation to drug metabolism, which can be slow or fast, affecting its level in blood. The dose-related side-effects include acute cerebellar ataxia, chronic cerebellar atrophy, cardiac manifestations, cosmetic effects, hematologic and metabolic bone diseases, and immune-mediated idiosyncratic adverse effects. Asymptomatic hyperammonemia is frequently seen in association with sodium valproate. Hyperammonemic encephalopathy is, however, rare and is characterized by the decrease in mental status, as well as the presence of confusion, and lethargy, which may progress to stupor or coma, increased seizure frequency, and rarely focal deficits., This syndrome is reversible and clinical features resolve in a few days after withdrawing the drug; the prolonged usage of the medication can rarely be fatal. Characteristically, the liver functions remain normal during the valproate-induced hyperammonemic encephalopathy. Although the exact mechanism of hyperammonemia is not clear, possibly valproate decreases the level of carnitine by enhancing its renal excretion and forming an intracellular complex with carnitine and co- enzyme-A, which in turn, inhibits carbamoyl phosphatase synthetase I, the first enzyme of the urea cycle. Therefore, the ammonia level in circulation rises and it crosses the blood–brain barrier to affect the brain despite some of it getting converted into glutamine. It has been reported with the use of other antiepileptic drugs also, but usually in a polytherapy setting, which may or may not include sodium valproate. Phenytoin modulates the renal handling of ammonia, and thereby increases the propensity of valproate to cause hyperammonemia. The outstanding features of the present case were the rapid reversibility of the clinical features suggesting the presence of metabolic disturbance; and, a very high ammonia level along with mildly raised phenytoin level. As phenytoin toxicity usually presents with cerebellar symptoms and signs, the presence of encephalopathy seen in the present case was unusual. 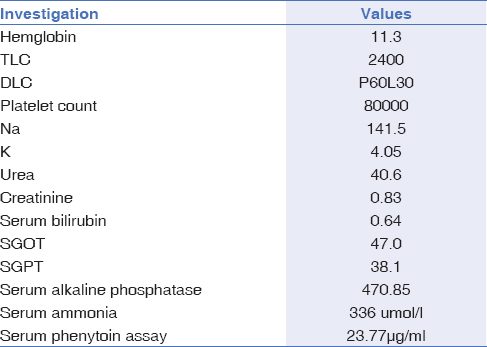 Moreover, a very high plasma ammonia level, in contrast to the mildly raised plasma phenytoin level suggested hyperammonemia, which was the cause of encephalopathy. We know that patients on chronic phenytoin therapy may rarely develop encephalopathy with toxicity that is known as the ‘phenytoin encephalopathy syndrome’, but it is usually seen in pediatric patients and is associated with a very high phenytoin level, usually more than 40 μg/ml. This syndrome responds to cessation of phenytoin. The manifestations in our case clearly differ from that of the ‘phenytoin encephalopathy syndrome’ as the phenytoin level was only slightly higher, there was an acute development of symptoms, and a rapid resolution of the toxic manifestations occurred after stopping phenytoin. Although the encephalogram only suggested the presence of an encephalopathy, the changes in the magnetic resonance imaging (MRI) of the brain were supporting the manifestations of hyperammonemia. The mechanism of hyperammonemia caused by other antiepileptic drugs such as topiramate and carbamazepine is unclear but a sodium valproate-like mechanism has also been postulated for them. Phenytoin or its metabolites could have caused symptomatic hyperammonemia by their effect on the renal handling of ammonia. Other explanations could be the presence of a mechanism of action similar to that of sodium valproate, or an interference in the ammonia-to-glutamine conversion. The rarity of this event could possibly be related to genetic factors. The withdrawal of the offending drug remains the mainstay of the treatment in sodium valproate-induced hyperammonemic encephalopathy. Hence, we conclude that unexplained acute onset encephalopathy in a setting of suspected phenytoin toxicity could be due to hyperammonemia seen on phenytoin monotherapy. We extend our sincere gratitude to the patient and the institution for the permission to publish this report. Stern JM, Perruca E, Browne TR. Phenytoin, Fosphenytoin and other hydantoins. In: Engel J Jr., Pedley TA, editors. Epilepsy: A Comprehensive Textbook. 2nd ed. Vol. 2. Philadelphia: Lippincott Williams and Wilkins; 2008. Coude FX, Grimber G, Parvy P, Rabier D, Petit F. Inhibition of ureagenesis by valproate in rat hepatocytes. Role of N-acetylglutamate and acetyl-CoA. Biochem J 1983;216:233-6. Hantson P, Frederick A, van Rijckevorsel K. Hyperammonemic encephalopathy after adjunction of phenobarbital to chronic topiramate and oxcarbazepine therapy. Acta Neurol Belg 2015;115:777-8. Marescaux C, Warter JM, Brandt C, Rumbach L, Micheletti G, Chabrier G, et al. Adaptation of hepatic ammonia metabolism after chronic valproate administration in epileptics treated with phenytoin. Eur Neurol 1985;24:191-5. Yehya N, Saldarini CT, Koski ME, Davanzo P. Valproate-induced hyperammonemic encephalopathy. J Am Acad Child Adolesc Psychiatry 2004;43:926-7. Marescaux C, Warter JM, Micheletti G, Rumbach L, Coquillat G, Kurtz D. Stuporous episodes during treatment with sodium valproate: Report of seven cases. Epilepsia 1982;23:297-305. Triggs WJ, Gilmore RL, Millington DS, Cibula J, Bunch TS, Harman E. Valproate-associated carnitine deficiency and malignant cerebral edema in the absence of hepatic failure. Int J Clin Pharmacol Ther 1997;35:353-6. Camina MF, Rozas I, Castro-Gago M, Paz JM, Alonso C, Rodriguez-Segade S. Alteration of renal carnitine metabolism by anticonvulsant treatment. Neurology 1991;41:1444-8. Zwarts MJ, Sie O. A case report of phenytoin encephalopathy. 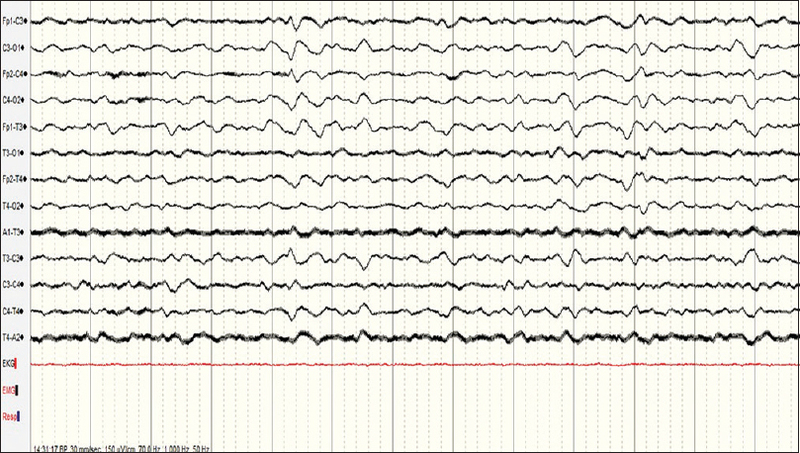 Correlation between serum levels, seizure increase, and EEG spike and wave activity. Clin Neurol Neurosurg 1985;87:205-8. Rovira A, Alonso J, Córdoba J. MR imaging findings in hepatic encephalopathy. AJNR Am J Neuroradiol 2008;29:1612-21.